Modern work trousers and work shorts can do more than classic denim jeans. They protect the wearer, allow maximum freedom of movement and high wear comfort and have helpful features such as pockets for tools, a mobile phone pocket and more. Most people have good tools and work shoes. However, many tend to neglect the subject of work trousers. You often see men wearing denim jeans or similar pants or shorts on the building site. The lightest of rain falls down, and the denim jeans soak it up. They hang heavy on the legs, stay damp for hours and the legs are cold whilst at work. It does not have to be like that. At engelbert strauss there are more than 150 different trousers, shorts and bib & brace models for men and women available in various colours and sizes. We want to make the choice easier and find the right work pants or shorts for you! Step 1 – Measure up! Measure your height first of all. 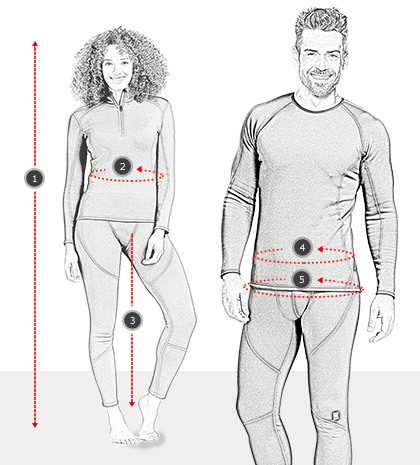 Measure around the waistband without pulling in tight. Measure around the waist without pulling in tight (approx. 3 cm above the hip bone). Measure horizontally over the widest part of the buttocks. Distance from the sole of the foot (inside) to the inside leg crotch. Note the measurements and open our Workwear size table. Depending on the body size, there are three various size models available for the ladies and mens ranges. Extra long sizes to fit tall and slim wearers and clever multiple size solutions as well as standard sizes to fit men and women ensure non-stop comfort. Step 2 – Trousers, shorts or bib and braces? At engelbert strauss you will be spoilt for choice, from work shorts and work trousers to bib & braces. Decide for yourself which type of trousers or shorts you prefer at work and which ones meet your needs. How you feel whilst wearing the workwear is crucial. Bib & braces are frequently chosen for comfort. The braces offer a very good fit and the sensitive kidney area is also always protected. But not everyone likes the feeling of having braces over outer clothing, preferring to choose trousers. Most of our collections therefore offer both models, meaning that they can be perfectly combined as teamwear. When making your purchase, make sure that the areas subject to high levels of strain every day are sufficiently reinforced. Numerous models of pants you can buy online have reinforced knee sections made from a particularly wear-resistant material. Work trousers from the e.s.roughtough and the e.s.dynashield collection feature additional triple stitched seams in places subject to high loads. This is mainly about the wearer's own personal taste and the purpose of use. Anyone who likes to wear their trousers or shorts in their free time can appreciate a few subtle side pockets on the pant legs. Men and women who like to keep things with them might prefer multipocket cargo trousers with spacious side pockets on the legs and back pockets, offering plenty of space for a measuring tape, mobile phone and tools. It is important that functionality and freedom of movement are not restricted. Knee pad pockets offer protection when working a lot in a kneeling position. The use of specially shaped knee pads reduces the strain on the knees and makes work easier. We offer knee pads with pockets featuring different material reinforcements such as Cordura, leather and nitrile. We also focus on practical solutions when inserting the knee pads. 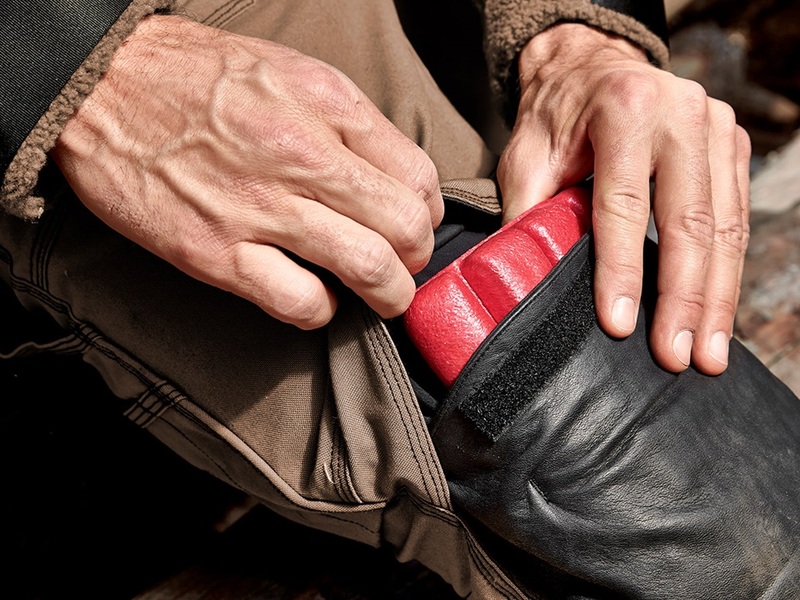 The concealed insert on the motion work trousers have proven to be very successful. The knee pads are fixed in place better and dirt penetration is also prevented. 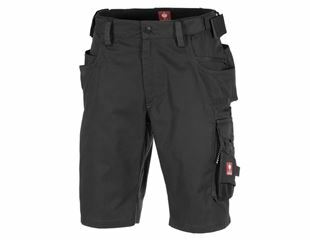 There are many factors that need to be considered when purchasing a pair of work pants or work shorts. With our various collections, we offer pants and shorts to meet every need. Do you work in forests or in poor visibility conditions in road traffic? Many of the engelbert strauss work pants and shorts have subtle reflectors to protect you in the dark. 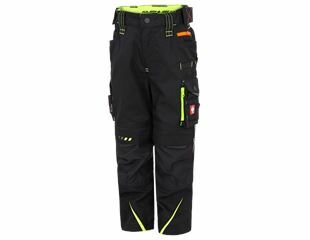 If these are not enough, our range of hi-vis trousers with high-quality reflectors is right for you. These models are also available as trousers or bib & braces. The profession and the weather conditions determine the material! Workwear made from cotton is soft to touch and pleasant against the skin. The natural fibres impress with features such as good moisture absorption, high strength and optimum rip-stop, but they dry slowly. Workwear made from synthetic material is particularly non-fade and weather resistant. 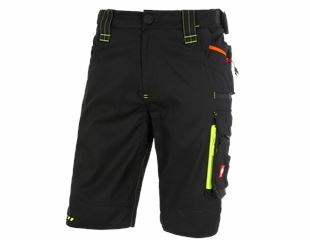 The trouser and short material is very hard-wearing, easy-care and fast drying. Polycotton fabric offers many advantages for workwear. Cotton absorbs moisture well and polyester ensures fast drying. Fabrics with mademan fibres such as polyester or polyamide generally absorb less moisture and quickly transport it outwards. 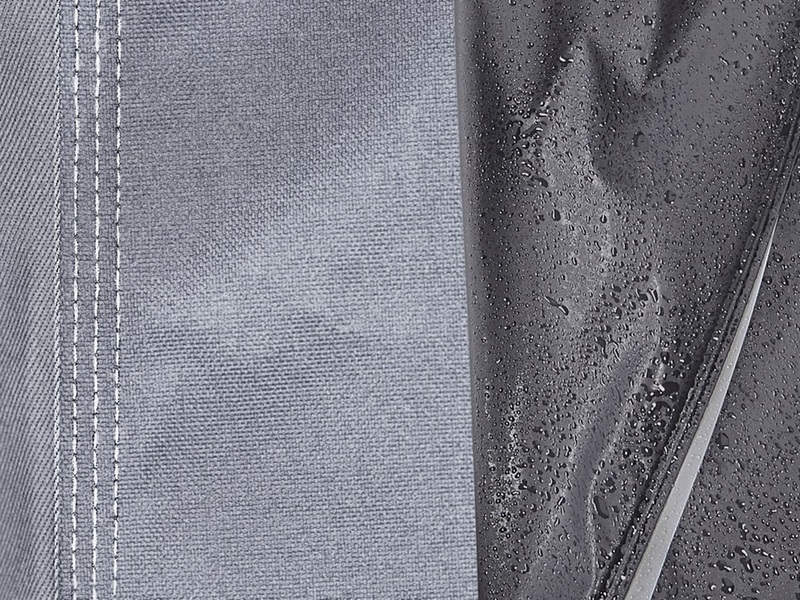 Reliable protection in the wet can be achieved with a pair of specially coated rain pants, which also keeps the wind and draughts away from the body. Step 4 – which collection is best for my area of use? Work trousers and work shorts from the engelbert strauss workwear ranges are suitable for a wide range of application areas. They differ in terms of weight, material and features. 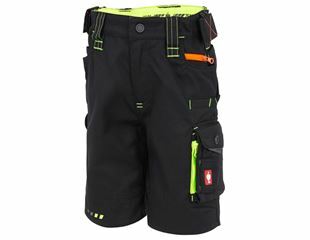 There are also special pants and shorts designed for certain professions, such as cut protection trousers with a cut protection insert, welder's pants made from a special fabric mix to protect against heat and flames, chef's trousers, care clothing or hi-vis trousers in bright colours. Step 5 – how do I wash my work trousers or shorts? 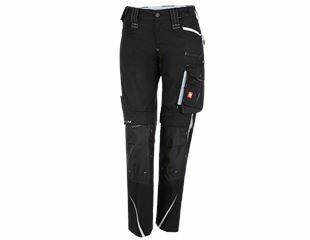 Work pants and shorts are exposed to liquids such as oil and other dirt in many professions. Empty your pockets before you wash your work trousers or shorts. Nails or tools left in the trouser or short pockets can destroy your workwear and the washing machine. Then close all zips so that they do not damage the rest of the laundry. Sort your workwear into colours and refer to the care label to find out the maximum temperature for washing your trousers or shorts. Multi-coloured workwear or clothing with contrasting trims, prints, and embroidered or printed logos require special care. Here we recommended our e.s. Washing powder colour plus. The high-performance washing detergent is even suitable for cleaning membrane textiles and effectively combating dirt whilst protecting colours and fibres. For white textiles, we also offer the e.s. Washing powder hygienic fresh, which is a special washing detergent with a disinfectant effect - especially interesting for sweatshirts, trousers or tunics in care professions or for work clothes used in gastronomy. Important advice on caring for functional clothing and PPE, such as safety clothing like hi vis or cut protection clothing, as well as tips on caring for safety footwear properly can be found in our FAQs. 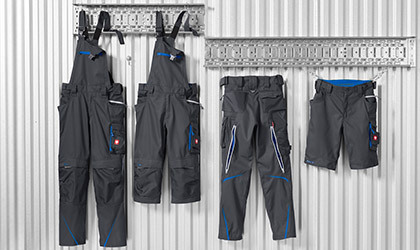 engelbert strauss not only offers premium work pants and work shorts, but also modern and sporty workwear, which offers a high level of individuality for the individual employee as well as a coordinated team look. Like in a modular system, the individual pieces of the Workwear collections are colour coordinated. Alongside Work jackets & T-Shirts, there are plenty of Accessories to combine. Even Work shoes and Safety shoes 3 harmonise with the existing company outfit in terms of design and colour combinations. 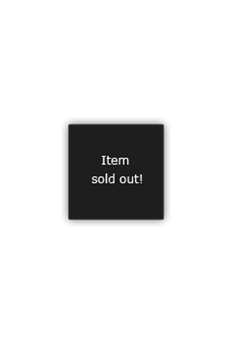 In this way, you can receive the everything you need, quickly and reliably from a single source, by placing a single order.